ON A MISTY MORNING IN SPRING 2008, federal biologist Jack Jeffrey was leading a class of middle schoolers up the eastern slope of Mauna Kea, beneath the towering koa and 'ōhi'a trees of Hakalau Forest National Wildlife Refuge on the Big Island of Hawai'i. The students had just spent two days in Hakalau's greenhouse, tending seedlings of endangered plants being readied for planting in the upper areas of the refuge's nearly 33,000 acres, which stretch from 2,500 to 6,500 feet above sea level. The reward for their hard work was a morning birding adventure in the refuge, an ideal spot for such an outing. The U.S. government established Hakalau in 1985 specifically to protect 14 species of Hawaiian birds, most of them endangered, in one of the island's last large remnants of upland rain forest. During the next two decades, refuge staff and volunteers would expand this forest by around 5,000 acres by restoring mountaintop habitat that cattle grazing had devastated. As was Jeffrey's habit, he led his young visitors to a cluster of small, candelabra-shaped trees, their upward-curving branches ending in sprays of strap-shaped leaves. Jeffrey liked to use this grove of flowering lobeliads as a backdrop for his talk on the 19 years of restoration efforts that followed the plant's rediscovery in the refuge in 1989. Most North American gardeners know lobeliads as small flowering herbs commonly used in window boxes. But some 13 million years ago, one or more lobeliad relatives somehow reached the shores of Hawai'i. From these first colonists a spectacular array of 125 species evolved to include many flowering bushes and trees--none of them found anywhere else on Earth. Among their unique features, many Hawaiian lobeliads evolved long tubular blossoms and fleshy fruit designed to be pollinated and dispersed by Hawaiian birds, many of which likewise are found nowhere else. But like much of Hawai'i's unique flora, many of its lobeliads were decimated by pigs-first introduced by Polynesians-and by cattle, sheep and goats presented by 18th-century European explorers as gifts to Hawaiian royalty. 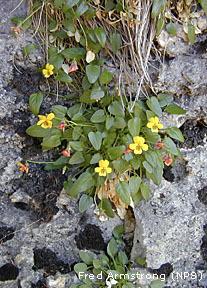 Today many native lobeliads are extinct or cling to survival in precarious perches such as cliffs, out of the reach of these voracious grazing animals. The grove where Jeffrey took his visitors was the refuge's most mature planting of the endangered lobeliad Clermontia lindseyana. Nearby were plantings of its even rarer cousins: Clermontia pyrularia and Cyanea shipmanii. Each of these species' serendipitous rediscovery in and around Hakalau had been followed by years of hit-and-miss efforts to learn how to hand-pollinate its blossoms, germinate its seeds and find the right ecological niche for the plant to thrive, Jeffrey explained. Germination, for example, proved almost impossible for one species until a colleague had the idea of feeding the seeds to the critically endangered 'alalā, or Hawaiian crow, once an important forest-seed disperser that survives now only in captivity. The experiment worked, and the partially digested seeds produced hundreds of seedlings. Since then, refuge staff have planted these seeds across Hakalau's higher slopes to produce today's mature groves. The hope, Jeffrey explained, was that the groves would attract Hakalau's population of 'i'iwi, a crimson honeycreeper whose long, sickle-shaped bill perfectly matches the trees' blossoms. When an 'i'iwi reaches through the tubular flower to get its nectar, the bird collects a smudge of pollen on its forehead and transfers the pollen to the next blossom it visits. By contrast, common birds such as the 'amakihi simply punch holes in the base of lobeliad flowers to steal nectar without pollinating the plants. 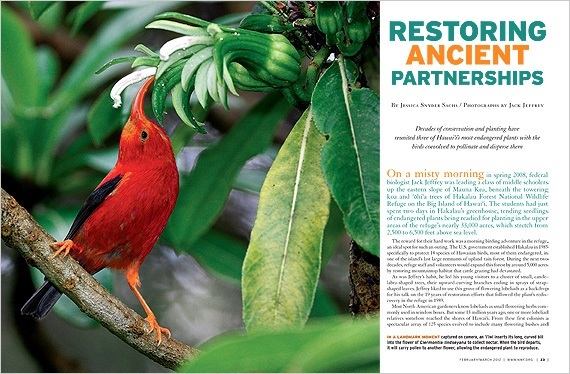 As Hakalau refuge supports one of the last healthy populations of 'i'iwi (around 100,000 birds), hopes were high that this ancient symbiotic relationship could be restored. But year after year, 'i'iwi ignored the plants, Jeffrey told the students. "They've forgotten their ancient nectar source." And without pollination, there was little hope for completing the second half of the plants' natural reproductive cycle: the dispersal of their seeds by the refuge's population of 'ōma'o, or Hawai'i thrush. As a result, the aging groves of lobeliad plantings were gradually dying off instead of spreading. "So there I was, deep into my 'woe is me' speech," Jeffrey recalls, "when I see these kids start to grin. They're looking right past me, their eyes big as saucers, and I'm thinking, 'Hey, this is serious stuff I'm telling you!'" The students' teacher pointed over Jeffrey's shoulder. "Look, Jack," she whispered. The biologist turned to see an 'i'iwi insert its long bill into a curving lobeliad blossom and then into another and yet a third before flying away. Hawai'i is home to around 1,000 species of flowering plants that arose during millions of years of isolation and coevolution with the islands' native animals. 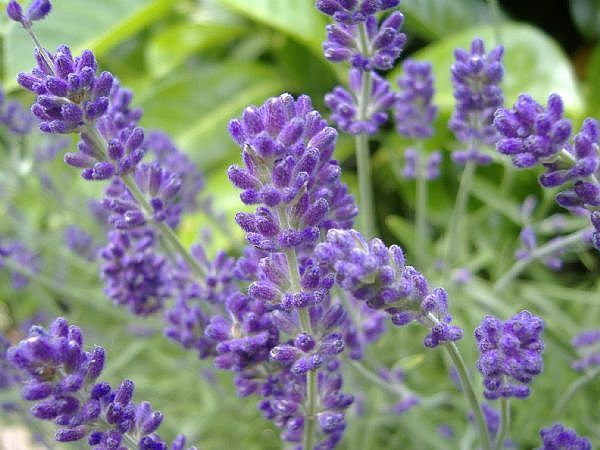 More than 60 percent of these plants depend on birds for pollination, seed dispersal or both. And some of the most spectacular coevolved adaptations have taken place between native lobeliads and honeycreepers such as the 'i'iwi. 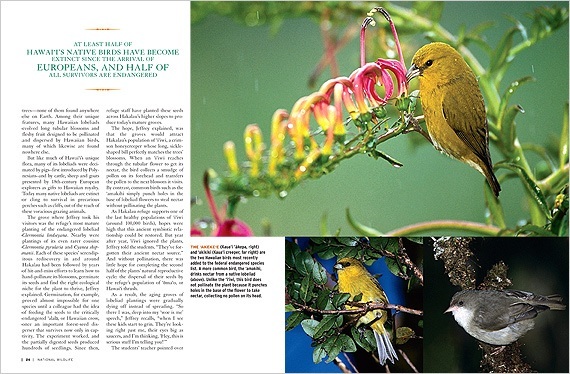 "If Darwin had explored Hawai'i instead of the Galápagos, he might not have needed all those years to work out his theory of evolution," says University of Hawai'i ecologist Jonathan Price, referring to the striking match between native blossoms and beaks. 75 percent of the nation's plant and bird extinctions. Currently, more than 400 Hawaiian plant and animal species are listed as threatened or endangered by the U.S. Fish and Wildlife Service--nearly all found in the wild only on this small island chain. At least half of Hawai'i's native birds (71 species) have become extinct since the arrival of Europeans, and half of all survivors are endangered, the 'akeke'e (Kaua'i 'ākepa) and 'akikiki (Kaua'i creeper) being the most recently listed. One of the greatest threats is the rapid spread of nonnative diseases such as bird pox and avian malaria, carried by nonnative mosquitoes that breed in the mud wallows created by nonnative pigs and in the hollowed-out trunks of tree ferns, which are knocked down and eaten by the pigs. "So many bird pollinators, including the 'i'iwi, have largely disappeared from lower elevations," says Marjorie Ziegler, executive director of the Conservation Council for Hawai'i. "Upper-elevation forests at Hakalau--currently too cool for breeding mosquitoes--are essential to the survival of native forest birds." Yet as climate change drives temperatures up, she adds, mosquitoes likewise are expanding their range into higher elevations. Indeed, virtually all of Hawai'i's wildlife faces the triple threat of invasive species, climate change and habitat destruction, says Bruce Stein, NWF's director of climate change adaptation and a lobeliad expert. The Federation recently adopted a special resolution recognizing the biodiversity conservation challenges facing Hawai'i and urging the federal government to increase funding for species recovery and habitat protection, strengthen measures to prevent further introduction and spread of invasive species, and collaborate with the state government to address climate change in its wildlife-action plans. For many of Hawai'i's most spectacular plants and birds, hopes of recovery hinge on re-establishing age-old ecological partnerships such as that between the 'i'iwi and native lobeliads. But some of these symbiotic relationships are known or inferred only from historical records. Recently, Price and his students at the University of Hawai'i began harnessing technology to clarify some of these ancient relationships. "We've photographed the rarest of our flowers and scanned in images of possible pollinators," he says. The team recently made its first positive match. It involved Kokia drynariodes, a tree of which there is just a handful of individuals in the wild (on the island of Hawai'i). Though most closely related to cotton, the tree sports giant red blossoms that resemble oversized hibiscus flowers. "We knew it must have catered to a very long-billed pollinator," Price says. And in fact, overlaying images on a computer revealed a hand-in-glove match with the kioea, a giant honeyeater and the largest of Hawai'i's bird pollinators. "It was almost magical," Price says of the overlay of bill and blossom. "Like we were seeing this interaction emerge from the mists of time." For tragically, the kioea is known only from museum specimens, having gone extinct in the mid-1800s. The search continues for matches between surviving Hawaiian birds and the rare plants they may have forgotten. The information could be used to guide replanting efforts like those at Hakalau. At present, the 'i'iwi is looking like the lynchpin for a number of endangered flowering trees, Price says. "The dilemma is that we don't have large populations of 'i'iwi outside places like Hakalau." Already, such grim realities have inspired some of the world's most audacious conservation measures: Field botanists such as Kenneth Wood of Hawai'i's National Tropical Botanical Garden are renowned for rappelling down vertical cliffs to use pipe cleaners to hand-pollinate endangered plants clinging to existence out of the reach of feral goats, pigs and cattle. At Hakalau in fall 2010, Jeffrey was leading a group of college students to his favorite patch of C. lindseyana, telling the story of how the middle schoolers had looked over his shoulder to witness the plant's historic reunion with the 'i'iwi. Soon after, 'i'iwi also rediscovered the other two endangered lobeliad species planted by refuge staff. "I was relating how exciting it had been to see the pollination," Jeffrey recalls, "but that I was sad to be retiring soon without seeing the seed dispersed by the 'ōma'o to complete the cycle." A whirr of wings interrupted Jeffrey's lament. Looking up, he and the students saw a plump brown bird launch itself out of the bushes. Yes, an 'ōma'o. "I'm thinking, 'Can this really be happening?'" Jeffrey recalls. He rushed into the grove that the bird had just exited and examined the lobeliad's small, round, green-yellow fruits. Several bore the 'ōma'o's distinctive triangular bill marks, exposing the bright orange seed pulp inside. "It was true!" Jeffrey says. "We had shown that 'if you plant it, they will come!'" Three months later, Jack Jeffrey retired a happy man--or at least a hopeful one. Jessica Snyder Sachs is a New Jersey-based writer and frequent contributor. Thanks to Mark Wexler, editorial director of National Wildlife, for inviting me to explore 75 years of conservation history for the magazine's special NWF anniversary issue. This is a truly remarkable organization that has evolved from protecting American game animals to leading the global campaign to combat climate change. The full story is now up on the magazine's website. Thanks to Mark Wexler, my longtime editor at National Wildlife, for one of the most interesting assignments in the 15 years I've been writing for him. 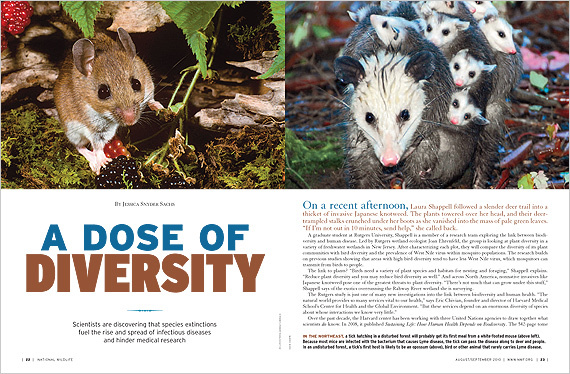 "A Dose of Diversity" shines a spotlight on the scientists documenting a clear link between reduced biodiversity and the outbreak and spread of infectious diseases such as West Nile virus, Lyme disease, and many others. It's the cover story in this month's issue. 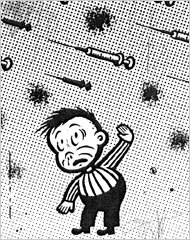 The New York Times invited me to contribute an op-ed piece on The Squishy Science of Food Allergies, as part of the paper's new online discussion board: Room For Debate. The discussion springs from a report in this week's New England Journal of Medicine indicating that many more people think they have food allergies than actually have them. My two-cents worth looks into the perception and reality of a modern epidemic of allergic disease in the context of the Hygiene Hypothesis. More to say in Good Germs, Bad Germs, now in paperback. Can flu vaccine prevent heart attack? While researching an immunology story for Discover magazine, I just ran across an interesting study in the New England Journal of Medicine: "Influenza Vaccination and Reduction in Hospitalizations for Cardiac Disease." The fascinating part for me (immunology nerd that I am) is the finding that when someone has the flu, the immune system's infection-fighting response directly promotes arterial inflammation and plaque in a way that can trigger heart attack and stroke. Meanwhile, it turns out that cardiology researchers have been giving flu vaccine to men with established cardiovascular disease in placebo-controlled studies. The result: Those who got the genuine flu jab were half as likely to die of heart attack over the next six months than were those who got the placebo. In fact, researchers are suggesting that the protection from flu vaccination might be due to more than flu prevention. Vaccination may, in fact, generate an immune response that helps clear away artery-clogging plaque. WILD ANIMALS may always be conservation's poster children, but without plants we would lose the very foundation of our terrestrial ecosystems. Sadly, that diversity is shrinking precipitously. 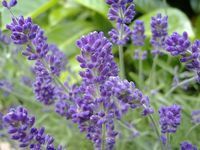 In the United States alone, between 20 and 30 percent of native plant species are now considered at risk of extinction. The bright spot in this grim picture is the fact that new populations of imperiled plants are being located every year. Some represent a payoff for years of conservation work. Others are the result of fortuitous discoveries. And still others are being found with help of computer modeling. "The thing about rare plant species," explains botanist Bruce Stein, "is that they are often hidden in plain sight." READ MORE IN THE APRIL/MAY ISSUE of National Wildlife. 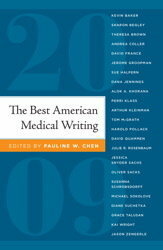 First written for Discover magazine, "DNA Pollution May Be Spawning Killer Microbes" is out in this year's edition of The Best American Medical Writing. (just got my copy--smile) You can read the full text in this website's archive of past Discover articles. FROM THE DOCK of British Columbia's Hartley Bay, guide Marvin Robinson looks across the waters of the Douglass Channel to Gribbell Island. The 96-square-mile island--thickly forested in hemlock, cedar and fir--is home to the world's highest concentration of the rare "spirit bear"--a pale color variant of the American black bear. Long revered by the First Nations of British Columbia, scientists dubbed it the Kermode bear in 1905 after one of the first scientists to study the species, Francis Kermode. ... READ MORE at NATIONAL WILDLIFE. 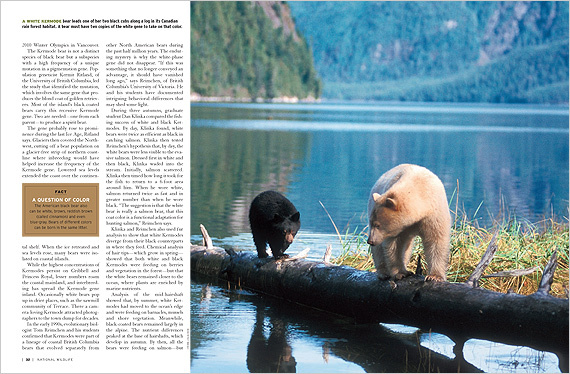 For this month's issue of National Wildlife I had the pleasure of researching and writing "Spirit Bear: Icon for an Endangered Ecosystem." I've been enamored with this subspecies of black bear--also known as the Kermode bear--ever since I first caught a glimpse of one (or imagined I did) in the 1970s at a dump in Terrace, BC. In recent years, the BC government has worked with conservationists, First Nations, and timber companies to protect the Spirit Bear's habitat--the largest intact stretch of temperate rain forest in the world. But today this ecosystem -- and Canada's beloved "panda" -- remain at risk, with an ominous new threat of oil tanker traffic on the horizon.